Louise Hopkins is an artist living and working in Glasgow, Scotland. She makes paintings and drawings directly onto surfaces that already contain information; world maps, patterned furnishing fabric, comics, catalogue pages, magazine pages, photographs, folded or crumpled paper and sheet music. Recently she has been developing large scale works such as Dance Number a temporary outdoor commission in Glasgow, and Flying Fox a temporary commission at CAMPLE LINE in rural Dumfriesshire. '...The printed materials she chooses often have social or political associations. The certainty that maps, shopping magazines or manufactured textiles might offer seems to be questioned when they are transformed into a painting or drawing. Hopkins’s works suggest a chain of contrasts – between mass-produced and handcrafted, reality and artifice, positive and negative, surface and depth, hidden and exposed. 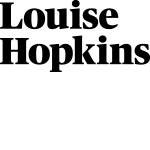 In an increasingly fast-paced, image-led world, Hopkins’s interventions are labour-intensive and time-consuming. She slows down time, inviting us to absorb the information she eradicates or exposes through the physical act of painting. In this way, she makes us question the things we see – not only in her work, but in the world around us.’ Lucy Askew (1). ‘Her elegant exposure of the tension between the printed image and the hand-made mark is a rejection of expressive traditions in painting but is accompanied by an understated but often emotional undertow. What does it mean when a map of Europe is altered to obliterate the sea between us and mainland Europe? Or when all the oceans appear to run dry?’ Moira Jeffrey (2). ‘Catalogue pages depicting jewellery and tools have been fancifully doctored to include severed sausagey fingers, ringed-through like felled trees, inside diamond rings, while DIY saws appear to have decapitated a series of crowned/dunce-capped women…Hopkins’s new narratives are, perhaps, more trashy, the means through which she undermines the authority of public material, more irreverent than we’re used to. While beauty and tactility play a part, as ever, in luring us to each surface, what we witness upon arrival is so much more than pretty’. Rebecca Geldard (3). In 2018 Hopkins made Flying Fox - a temporary commission and exhibition at CAMPLE LINE in rural Dumfriesshire. In 2017 she made Dance Number, a temporary artist wall commission outside the Mackintosh Building at Glasgow School of Art. In 2015/16 a group of 7 works were included in Dévider le reel at Les Abattoirs, FRAC Midi-Pyrenees. In 2014 Hopkins had a one-person exhibition Black Sea, White Sea as part of GENERATION, the celebration of 25 years of Contemporary Art in Scotland. In 2007 she was one of 6 artists to represent Scotland at the 52nd Venice Biennale, and in 2005 she had a major one-person exhibition Freedom of Information at the Fruitmarket Gallery in Edinburgh.